In recently years, these awesome Inflatable Bubble Lodge have become one of the most sought-after around. They bring a whole new meaning to the word‘glamping’ allowing you to reconnect with nature and stargaze with no obstructions, making for the perfect one or two night stay in nature. 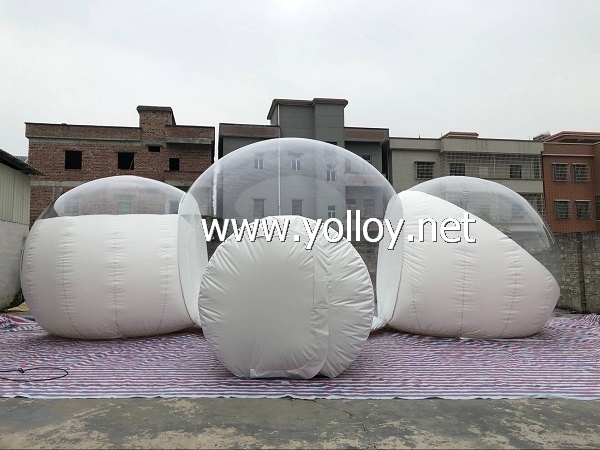 If you’re looking for an inflatable bubble tent then you have come to the right place. We are going to review the best tents currently on the market, in particular, the Inflatable Bubble Lodge Tent! Following are details you will be interested in it. Some main points you may pay a attention to them. 1) How do I set up the tent? Firstly, blow up the globe with blower. When the globe is standing up and keep the inflatable shape, go inside the globe and inflate the white tube with air pump. Do not inflate the tube fully, 60%~80% air inside is enough. 2) How will I deal with anchoring this to the ground in the event of wind? Fixing the tent on the ground tightly with some sandbags or stone and ropes. However, we don’t suggest to set up inflatable bubble tent in the high wind for it's an inflatable product. 3) What is the good position to put the Inflatable Bubble Lodge on it? The product is inflatable, so you have to make sure the base without any sharp objects. We don’t suggest to put the tent on the dirt or landscaping bark, because dirt would make the tent dirty, and it’s also not easy to fix tightly. Bark would stab the tent.